This photodamage classification system was developed by Dr. Richard Glogau and is designed to help you determine your skin aging type. This scale is widely used by dermatologists and plastic surgeons to successfully match your skin type and skin condition with therapy that is appropriate for you. Type 1: Early Wrinkles' Patient age: 20s to 30s -Early photo-aging, mild pigment changes, minimal wrinkles. No 'age spots'. 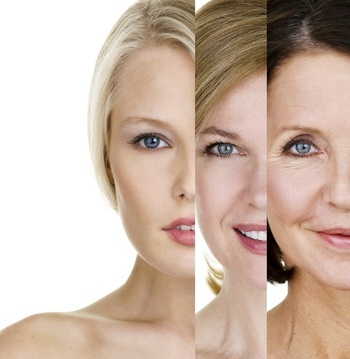 Type 2: Wrinkles in Motion' Patient age: 30s to 40s -Early to moderate photo-aging, appearance of smile lines, early brown 'age spots', skin pores more prominent, early changes in skin texture. Type 3: Wrinkles at Rest' Patient age: 50s & older- Advanced photoaging, prominent brown pigmentation, visible brown age spot, small blood vessels and wrinkles, even at rest.